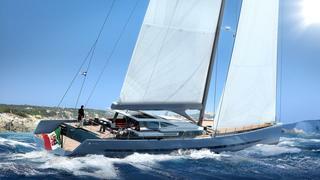 The 38 metre sailing yacht Admiral Wave has been jointly listed for sale by Camper & Nicholsons and Northrop & Johnson. Currently under construction in aluminium by the Italian Sea Group to a design by Philippe Briand, she is scheduled to be delivered in 2018 as the second hull in the yard’s 38m Admiral Wave series. Accommodation is completely customizable and is currently configured for eight guests in four cabins consisting of a full beam master suite aft, two doubles and a saloon that converts into a further double, all with full en suite facilities. Sloop rigged and fitted with a carbon fibre mast and furling boom along with a lifting keel and a large sail area, she should show an excellent turn of speed as well as comfortable long range cruising capability. The cockpit of this yacht for sale is protected by an integrated hard top, which can be fully enclosed with retractable window panes to transform it into an intimate formal dining area. The large aft terrace includes a sunbathing platform with access to the sea from the aft master suite. The Italian Sea Group announced the sale of the first hull in the 38m Admiral Wave Series at the 2015 Monaco Yacht Show. The Admiral Wave 38m is asking €16.6 million.